It is to The Legal Genealogist‘s everlasting shame that there is no answer to one question there should be an answer to. Where were my family members — my grandparents, my parents, my aunts and uncles — where were they on that day? In just a few days, this nation will be marking the 75th anniversary of one of those defining moments of an entire generation. A moment that literally changed the world, for every single member of my family and for everyone they knew. And yet, to my chagrin, I realize that I never asked. Where were they — what were they doing — how did they learn what had happened — on that fateful day… Sunday… December 7, 1941? On that day, Japanese planes attacked the United States Naval Base at Pearl Harbor, Hawaii Territory. The bombing killed more than 2,300 Americans. It completely destroyed the American battleship U.S.S. Arizona and capsized the U.S.S. Oklahoma. The attack sank or beached a total of twelve ships and damaged nine others. 160 aircraft were destroyed and 150 others damaged. 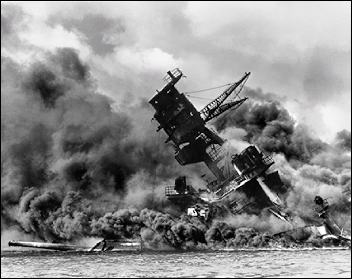 The attack took the country by surprise, especially the ill-prepared Pearl Harbor base. The ranking United States naval officer in Pearl Harbor, known as the Commander-in-Chief Pacific, sent this hurried dispatch to all major navy commands and fleet units. Radio stations receiving the news interrupted regular broadcasts to announce the tragic news to the American public. Most people knew what the attack meant for the U.S. even before Roosevelt’s official announcement the next day. The U.S. would declare war on Japan. The attack began at 7:53 a.m. Hawaii time with the arrival of the first wave of attacking planes; the second wave hit at 8:55 a.m. and it was over before 10 a.m.2… that meant it was already afternoon in Midland, Texas, where my mother — then 15 — lived with her parents and siblings, and in Chicago, Illinois, where my father — then 20 — and his parents were living. So the historical record is there, readily accessible, for us to review and to incorporate into our family histories. What’s missing… what I can never capture now… is the personal side of this story. My father’s parents were dead before I was born. My mother’s father when I was just 19. I didn’t get into genealogy until most of the surviving older members of my family were gone: both of my parents, my one surviving grandparent, even some of my aunts and uncles. Once I got into genealogy, I focused — as beginners do — more on who my ancestors were than on what the living members of the family could tell me about their own lives. And while I paid attention to the who of family history, one by one, those living members began to disappear. Taking their stories, their memories, with them. There is, today, only one living member of my entire family who was old enough to remember that day, 75 years ago, when the world changed. And he is 88 years old and in poor health. I’ve asked my youngest aunt, his youngest sibling, to see if she can find a time when his body, mind and soul are up to the task, and to ask him about that day… but it won’t surprise me if that time never comes. And I am left where I began. With a generation of memories… gone missing. If there’s one club a genealogist doesn’t ever want to join, it’s the club of those with a generation of memories… gone missing. Image: The USS Arizona (BB-39) burning after the Japanese attack on Pearl Harbor, Franklin D. Roosevelt Presidential Library, National Archives. I know where my father was on that day, but had never thought of it in the context of Pearl Harbor. My father and his younger siblings were at home because their mother had just died at the age of 40 on December 7, 1941. His older brother and sister were already grown and had moved on into their own lives. My father passed away in 1993 and I never thought to ask him about that day in the context of the attack on Pearl Harbor. That personal loss would surely outweigh everything else on that day! I know where I was on that infamous day. I was almost four years old and was living with my mother and one and a half year old brother just above Pearl Harbor in ‘Ālewa Heights. My father was a Marine Corps officer stationed out in the Pacific and he had shipped out of Pearl Harbor on the USS Wharton exactly three months earlier on September 7th. Mother worked for the Censor Board in Honolulu clipping sensitive material from letters headed back to the states. According to the notes my mother took on the morning of December 7th we watched the bombing from our home as she desperately tried to figure out how we were going to get through this catastrophe. She had a German Lugar pistol that she had carried to work every day in her handbag but our food supplies were low. Suddenly the days of parties and fun on the beaches were gone, now we had to figure out how to survive in a war zone. (I still have to transcribe the rest of mothers notes from that time in our lives.) I do know that my brother and I were finally evacuated from Hawaii the following March after an aborted earlier evacuation. Mother chose to stay on in Hawaii in case my father came back so we flew back to the states with my mother’s housemate who had a infant daughter. I was able to find the manifest and a picture of the actual plane that we were evacuated on. Surprisingly, there were only about 26 passengers on the huge plane. My grandparents were waiting for us in San Francisco ready to take my brother and me back to Seattle but bad weather forced a landing in Los Angeles, necessitating a quick change of plans. My mother returned to Seattle several months later without reconnecting to my father who remained in the Pacific for almost four years. The marriage did not survive the war. I do not personally remember the attack but one of the results of the war was that all of our Christmas presents from our family in Seattle, including a climbing gym for me and my brother and a Pacific Northwest Christmas tree went to the bottom of the Pacific as the ship they were on was torpedoed on its way to Hawaii. What a great story! Thanks for sharing it with us. I’m in the same position you are. One set of grandparents died before I was born, but I knew well the other set, and I even knew a great grandfather who was very alert to the end. I know where my parents were living, but I don’t know exactly where they were in the sense that I can tell you precisely where I was when I heard that Kennedy had been shot, or Robert Kennedy, or Martin Luther King. I never thought to ask, though I have many stories of what my parents did during the war–they married in 1942 and I was born in 1944. I knew many of my grandparents’ generation too. Why did I never think to ask any of them? I never did ask my grandparents. A regret, though I suspect my grandmother would have told me a story she believed exemplified her truths. She was a great one for improving stories. My mother remembered clearly and was rather chagrined to share that her only response was annoyance that it would interfere with her 14th birthday festivities a few days hence. She soon realized how little that mattered. In other words, your mother was a normal going-on-14-year-old kid! Great story. Every Sunday, my father’s family used to gather at my grandparents’ home for a big Sunday dinner. My grandparents would be there, with all three of their sons and my grandmother’s brothers and sisters and their families. After the washingup, they’d spend the afternoon chatting, playing parlor games and listening to the radio. December 7, 1941 started out no different than every other Sunday. The radio was on, perhaps tuned in to the baseball game (this was Brooklyn, after all, and the Dodgers were playing). Then the broadcast was interrupted and their world changed forever. The goodbyes were said with the knowledge the country was at war. Within the year, Uncle Sam’s expected invitation came and Grandma put a second star banner in the front window, to join the one she placed there when his brother, the mechanic, was picked in the first round of the draft. Not long afterwards, when they started to draft married men, a third star went on display when his oldest brother was also drafted at age 34. Just about every house onnthe block had at least one star in the window. As time wore on, one by one, some of the stars were replaced by gold ones, but not Grandma’s. All three of her boys came home safe and sound. My Dad, the one who had intially been turned away as too old to serve, came home a commissioned officer. So many stories… thanks for sharing yours. My parents, siblings and I — and other relatives — talked about where my parents were on Dec. 7, 1941, every year because that was the day after my parents were married. On Dec. 7, 1941, they were on their honeymoon, driving from Iowa to New Orleans and heard the news on their car radio. Over the years I heard — and said — countless times that my parents — Ted and Edna — were “married the day before Pearl Habor”. Like others, by the time I started my genealogy journey in earnest, my dad and his parents were all gone. They were farmers in SW Kansas and did not even own a radio so I know they did not hear it on the radio themselves. Perhaps Dad, then 11, and his siblings heard it at school the next day. Or perhaps his Aunt Grace and Uncle Tom drove over to tell them. Dad rarely talked about his childhood so the few times he did, I mostly listened to what he wanted to say, afraid he’d clam up if I asked too many questions. On the other hand, I know where my mom was…playing in the dining room of the family home in a suburb of Denver. She heard it on the radio and went to the kitchen to ask her mother “What is Pearl Harbor?” Sadly, I never thought to ask either of her parents for their memories. I know exactly what was happening on the fateful day, because my parents would tell me every 7 December. My baptismal record also records that on 7 December I was baptized. My parents would recount for me that the baptism stated at 10:00am Mountain time (7:00am Honolulu time) and that I was taken home from church about 1-hour later. My parents were informed that Pearl Harbor was under attack; they went ahead with a familial celebration of my baptism the rest of the day, but everyone listened to the radio for news. I do remember the various stories of aunts and uncles and especially of my parents as they recounted that fateful day. My father-in-law is 100 and was a decorated ace pilot in WW2. Have many stories of his service but have never thought to ask where he was on Dec.7 1941.Tomorrow I will call and ask! His mind is still sharp though his body is getting tired.Thank you for the prompt!